Patan, the city known as the ‘City of Fine Arts’ is also the oldest city in the Kathmandu Valley. This very prestigious historical city owns the palace named Patan Darbar Square situated in the uphill of Bagmati River, the river which separates Kathmandu and Lalitpur district. The architectures and structures are the treasury of Malla dynasty since 16th century even though some of the historians have argued its setup with Pradhanas before Malla. Both Pradhanas and Mall represent Newar caste, the ethnic group of Kathmandu valley. Moreover, some of the scholars also have given the credit to Thakuri Dynasty for its establishment. However, the evidences in favour of Mall Dynasty and its contribution in its foundation has been found out more. For about two centuries Malla Dynasty was blessed to rule the Kingdom abiding in this magnificent palace having artistic and architectural richness. Therefore, the credit for enriching the arts and culture in Kathmandu valley has been given to the Malla Dynasty till the date. Patan is also known as the oldest Buddhist city in the world. This city has been the harmonious place between Buddhism and Hinduism since the time immemorial. In this property of Darbar Square many temples and architects have been erected which gleams its beauty. In 1979, it was included in the UNESCO World Heritage Site. It is one of the three Darbar Square constructed in the Kathmandu Valley. It was only opened for public in 1997 AD. The Darbar Square is an ornament of Newa architecture. The floor of the Darbar Square was embellished with the red bricks. The main temples stand opposite of the western face of the palace. The temples’ entrance face east where the palace is located. The bell has been aligned beside the main temples. 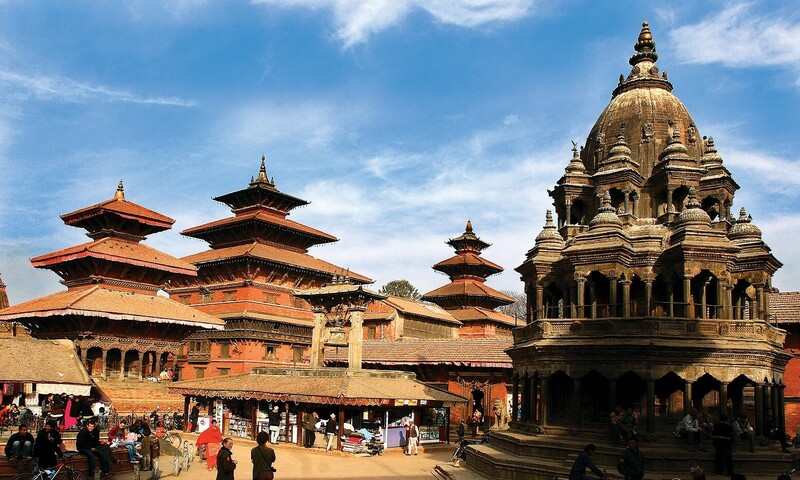 Along with major temples, different structures have been constructed in and around Patan Durbar Square. The Darbar Square was heavily wrecked by the mega-earthquake of April 25, 2014. Regarded as one of the richest museum in fine arts, it has possessed the bronze statue and religious object. It is located at the opposite side of the major temples. The entrance of the museum faces the front side of the temple. Inside the courtyard of the museum is Keshav Naraya Temple which also is known as Keshav Narayan Chowk. South of Keshav Naraya Chowk is Mul Chwok. King Siddhinarsinga Malla was the one who coined the idea to build the Krishna Temple in this place. The reason behind establishment of the Krishna Temple is interesting dream that he saw Krishna and Radha coming into his palace. On that very spot he commanded to construct the Krishna Temple which was built in 1637 AD. It took 17 long year to complete the construction of the temple which had been started in 1620 AD. The temple was carved in Shikara style. The incidents of Mahabharat and Ramayana have been carved in the stone pillar placed in the first and second floor of the temple. 21 golden pinnacles have been positioned on the top whereas in the third floor Lokeshwor has been placed; in the second the shrine of Lord Shiva has been kept and in the first floor Krishna’s shrine with Radha and Rukmini in his side has been established. During Krishnajanmastami, thousands of Hindu pilgrims and people visit this temple. This temple is opened only once in a year on the birthday of Lord Krishna which falls on 23rd of August. Bhimsen Temple is another attraction of Patan Darbar Square. It has three golden window inter-connected to each other which is its most prominent feature. The temple given the name after epic hero of Mahabharat, Bhimsen is worshipped by Newari community as the deity of business and trade. King Srinivasa Malla established the temple in 1680. The Temple laid two stone elephants on each side of the front entrance and having a statue of bull on the rear side of the temple is dedicated to the Lord Shiva. The carvings and crafts created on the roof of the temple resembles temples of Shiva found in India. Shiva Linga has been placed inside the temple. During the reign of Siddhinarsingha Malla, the temple was established in 1927. Having five stories with triple r Taleju Bhawani Templeoofts Taleju Bhawani Temple has been regarded as the personal deity of Malla Kings. Even though it was established in 1640 by Siddhinarsingha Malla, it was damaged by the fire. Later, King Srinivasa Malla renovated the temple in 1667. The Patan Darbar Square has been elaborated with three main chwok i.e. courtyards which are Keshav Narayan Chwok, Mul Chwok and Sundari Chwok. Keshav Narayan Chwok is situated inside the patan museum. Because of having the temple named Keshav Naraya on the courtyard chwok has been named after the temple. On the south of Keshav Narayan Chwok is located a Mul Chowk which is also the doorway to the Taleju Bhawani Temple. Sundari Chwok is treasured also with Tusha Hiti which means the Royal bath which has sunken water tank.